This picture is oddly appropriate for this post on the end of persimmon season. It's twilight over a persimmon tree in Kula. Picturesque persimmons growing in Kula, early fall. “Oh, that’s Richard Simmons’ cat… Purr Simmons.” That was the silliest answer I got, when I asked around to find information about persimmons. Most people I talked to, even farmers and gardeners, didn’t know much about persimmons. 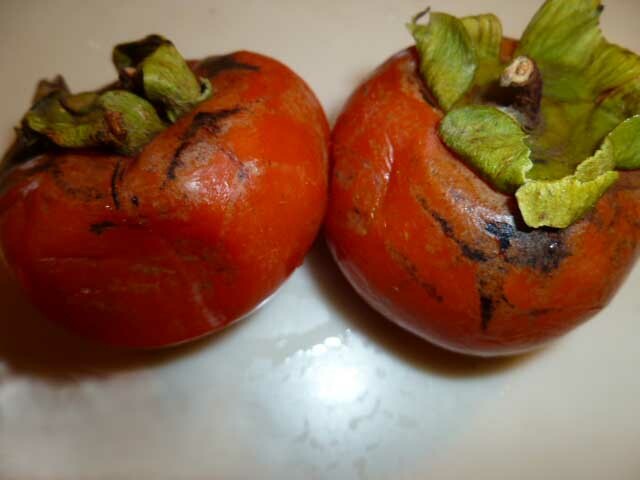 Even a friend who’s lived on Maui several years said she tried persimmons for the first time this fall. A beautiful persimmon still life photo by artist Carmen Gardner. This photo was used in her watercolor class. Another friend suggested that I write about persimmons, and I laughed, because all I knew is that I liked the mushy ones… I remember staying at a B & B in California, and picking mushy, sweet persimmons with an amazing fruit picker. But I’ve never seen mushy persimmons on Maui. The ones at the farmer’s market are meant to be eaten when they are firm and crunchy. Persimmons at a local farmer's market, mid October. These look like Maru persimmons. The season seems to start in late September and lasts through part of November, maybe December. I always notice the start of persimmon season when I see them appear at the local farmer’s markets. Fuyu, or fuyu-gaki according to a Japanese friend. Persimmons, by the way, are popular in Japan. This is the one I’ve seen most often. It’s a consistent glossy orangy-red. It reminds me of a somewhat flattened and very hard tomato. 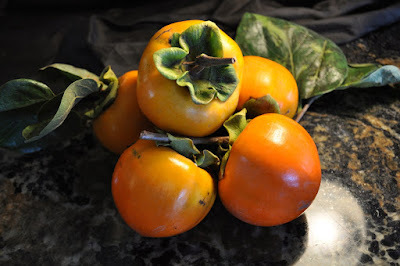 The fuyu persimmons are smaller and brighter orangey-red. The maru persimmon is larger and less reddish. Maru persimmons. This information comes from a tweet by Ryan, the produce manager at Mana Foods. Maru persimmons are generally sweeter, and not as pretty, with a light greenish shoulder. Ryan also said that Hashimoto Farms in Kula offers both persimmons, but the season had ended. I tasted a Maru and it did seem sweeter than the Fuyu. Hachiya persimmons. According to my Japanese friend, this variety is a little pointy compared to the Fuyu-gaki. “You have to wait till it's completely ripened. Otherwise it’s very astringent. Or you can dry it in the sun for while. Then the sweetness comes from the persimmons and they don’t taste bitter. Dried persimmons are called Hoshigaki.” Ah... these must be the ones I like. They are sweet when they are mushy! Kabba Anand sells dried persimmons at his acupuncture clinic in Olinda. I'm not sure if they are Hachiyas or not. Later this fall, I visited a friend in Makawao, and she had a very old persimmon tree in her yard. It was dropping persimmons in huge piles. I tried a soft, mushy one and it was delectable! She bit into a hard one and it was nasty tasting and made her mouth pucker. So.. this tree is probably a hachiya variety, or offshoot. I took some firmer persimmons home and they softened. I stashed them in the fridge when they were getting too soft. My plan was to dehydrate them. They looked terrible, all smashed up. But I tried a little bit of one, and it was delicious. The persimmons never made it to the dehydrator - they ended up in my stomach. Mushy and bruised hachiya persimmons, but they tasted sweet! Persimmon pudding. My watercolor teacher, Carmen Gardner, made a pudding out of the same persimmons she showed us in class. She said it was quite yummy. Perimmon pie. L Maui Gardener, who also posts here, said she made an excellent pie for Thanksgiving. I bet they can also be dehydrated into a fruit roll. Creative persimmon "cracker" appetizers by Chef Jana. Next year, I hope to visit Hashimoto Persimmon farm in Kula and write about persimmons during persimmon season. Maybe I'll even finish my persimmon watercolor painting from Carmen's class! A persimmon picture to inspire me for next year.